X specifies the order. If X is non-decreasing then y_ is non-decreasing. If not None, set the lowest value of the fit to y_min. If not None, set the highest value of the fit to y_max. If boolean, whether or not to fit the isotonic regression with y increasing or decreasing. The string value “auto” determines whether y should increase or decrease based on the Spearman correlation estimate’s sign. The out_of_bounds parameter handles how x-values outside of the training domain are handled. When set to “nan”, predicted y-values will be NaN. When set to “clip”, predicted y-values will be set to the value corresponding to the nearest train interval endpoint. When set to “raise”, allow interp1d to throw ValueError. Minimum value of input array X_ for left bound. Maximum value of input array X_ for right bound. The stepwise interpolating function that covers the input domain X. Ties are broken using the secondary method from Leeuw, 1977.
fit(self, X, y[, sample_weight]) Fit the model using X, y as training data. 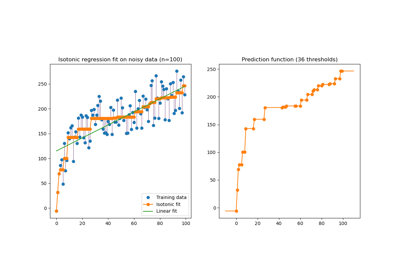 predict(self, T) Predict new data by linear interpolation. Weights. If set to None, all weights will be set to 1 (equal weights). X is stored for future use, as transform needs X to interpolate new input data. Predict new data by linear interpolation.